Fangraphs has a nice article out. In it, Dan Vogelbach concisely explains what his mindset is, and what his mechanical changes are, as he hits for more power (5 homers and 6 doubles in 46 AB). Since we are getting it straight from the horse's mouth, as it were, we'll trust the information. How is Vogelbach suddenly trashing enemy pitching to the tune of an .800+ SLG? 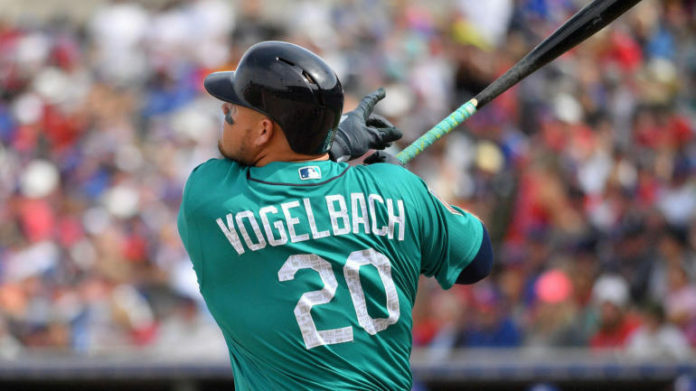 “I wasn’t using my hips the way I was supposed to use my hips,” explained Vogelbach, whose left-handed stroke has produced 100 home runs in 2,870 professional plate appearances. “I’m using my legs totally different now. I’m really shooting my hips forward. I’m using my back leg a lot more, and a lot better, than I ever have. In other words, though he was well capable of hitting like Wade Boggs, with an arm-swing that flipped the ball in to LF .... now he's getting the knees and hips out to produce some centrifugal torque. With a midsection like 'Bach's that can mean quaite a bit of it. Torque, that is. 3. More top-hand dominance. Bach explains that he throws R and bats L, so it's easy to pull the ball through with his bottom, dominant hand. He has "worked with top-hand drills, and a one-hand bat," to get more bicep and pectoral action into the swing. 4. Same Bat Path, Longer Finish. And on this one, it doesn't take a lot of drills to learn to follow through longer; that's the kind of thing you can master in 20 minutes. We kid ... a little. G used to aptly jibe 'Bach for his "sand-wedge swing" and now 'Bach will join the human race -- well, the race of major league 1B's, anyway. The latest intel on 1B was today's, where Servais said he "didn't rule it out," the idea of having Vogelbach start the year with the Mariners. This dovetails beautifully with Jerry Dipoto's statement a few days ago that "Vogey has earned his way onto this ballclub." IFF Dan Vogelbach was talent waiting to happen, and he is now a .290/.390/.500 hitter, then he'll get his chance and sooner rather than later. Ryon Healy's dream season is to hit what would you say, let's take HQ who loves him .280/.310/.470. with UP 35+ HR producing a .525 SLG. But no matter how much we love Healy, leave us not forget his EYE: a lousy 12:60 in 2016 (0.20) and an even worse 0.16 (23:142) in 2017. Something will happen, a slump or a pitched ball on the hand, or somethin', and Dan Vogelbach is going to get his chance to rake RH hitters. But it really seems he's just making a natural power progression: He now brings an intent, given his pitch, to hurt the ball when he comes to the plate. That said, last season had to be frustrating for him, in the sense that even when called up he didn't get his chance. Even when we were dead in the water he didn't get his chance. about cognitive development today, and I think some of what we covered might actually play here. You say, I think fairly, that 'Bach is 'just making a natural power progression.' But how many of us remember the moment--as in, the lightbulb exploding above our heads instant--when we realized that our parents were people in addition to being our parents? It's one of those major cognitive milestones that's almost certainly 'natural' to go through, with little in the way of direct intervention or happy circumstance necessary for its occurrence, but I would wager that of those who do remember that moment when they realized their parents were people, not just parents, we also remember a little bit of why that realization came to be. I do think that good hitters (usually) naturally learn to hit for more power. Look at Kyle Seager. His technical approach to producing power (pull any- and everything possible into the RF air, like a super Hank Blalock) is quite a bit different from 'Bach's but the result is the same: superior plate and contact skills 'suddenly' morph into above average power. Why? Empirically, we might not be all that interested in that question, but anecdotally and from the perspective of human cognition/psychology, it's a pretty fascinating question--the baseball equivalent, if you will, of asking 'why did you finally realize that your parents were people, just like you, and not just social units designed specifically for you?' Obviously we could discuss philosophy, behavioral models, or even neurology in order to get at the answer(s), which makes it an interesting question. No chiding you in the least, moe :-) Just thought I'd bring up what seemed like a reasonable segue on the current subject. I'm interested to hear why/how 'Bach intends to make the transition to +PWR hitter, though I do agree that it's a fairly 'natural' progression for someone with his skillset to (attempt to) make. 1. I remember in 6th grade, sitting in class, and suddenly being aware that I was a conscious human being, in a room full of other conscious human beings, and suddenly feeling rather nauseous. It’s like: wow. I exist. And they exist. Why? How? 2. That same year, I remember being on the school basketbal team. I loved basketball, but I was kind of on my own regarding how to excel in the game. So I took up space, whether on the floor or on the bench. One game, somehow, for reasons I couldn’t explain, because I’m not a twenty something like Vogs, in the middle of the game, something just “clicked”. I got aggressive, saw the whole floor differently, and became a ball stealing, defensive demon. The day finally came when everything just...clicked. So glad that it’s finally clicking for Vogs. It reminds me of Mike Carp. So, is DiPoto’s master plan to build while contend working, if Vogs is the player we think he could be, as is Haniger, Gonzales, Zunino, etc.? Has DiPoto become a net positive for this franchise? I know the job as GM is to be much more than that, but hey, in this franchise, we gotta walk before we can run. And maybe, we can start to chew gum while we’re at it.